This list shows the Vietnam Memorial Wall location of Members of the 1/83rd Artillery. They are in chronological order, according to the date of casualty within each day, the names are alphabetized. For the dead, the date of casualty is the date they were wounded (received in combat) or injured (received in an accident); for the missing, the date they were reported to be missing. The list starts and ends at the vertex (apex), beginning at the date 1959 (with first two names listed from the date of July 8, 1959) and the inscription (IN HONOR OF THE MEN AND WOMEN OF THE ARMED FORCES OF THE UNITED STATES WHO SERVED IN THE VIETNAM WAR. THE NAMES OF THOSE WHO GAVE THEIR LIVES AND OF THOSE WHO REMAIN MISSING ARE INSCRIBED IN THE ORDER THEY WERE TAKEN FROM US.) 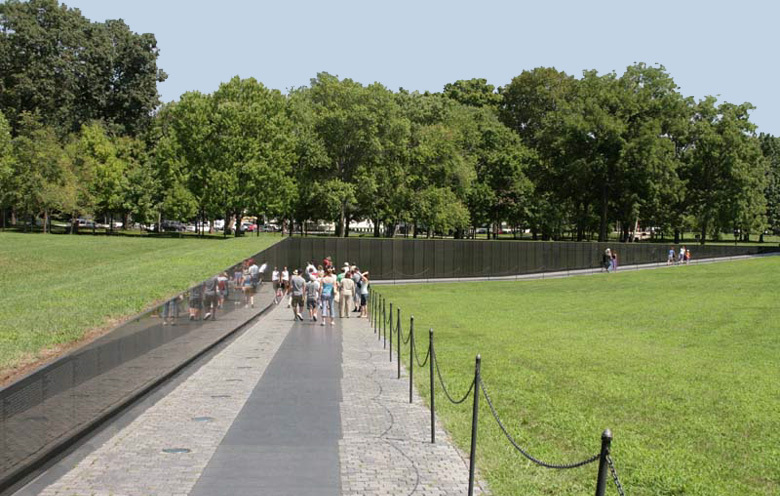 on panel 1E and going out to the end of the East wall, appearing to recede into the earth (numbered 70E - May 25, 1968), then resuming at the end of the West wall, as the wall emerges from the earth (numbered 70W - continuing May 25, 1968) and ending with the date of 1975 and its inscription (OUR NATION HONORS THE COURAGE, SACRIFICE AND DEVOTION TO DUTY AND COUNTRY OF ITS VIETNAM VETERANS. THIS MEMORIAL WAS BUILT WITH PRIVATE CONTRIBUTIONS FROM THE AMERICAN PEOPLE. NOVEMBER 11, 1982) at the bottom of 1W (last 18 names listed are from May 15, 1975). Thus the war's beginning and end meet; the war's complete, coming full circle, yet broken by the earth that bounds the angle's open side and contained within the earth itself. Although 1959 is marked as the beginning on Panel 1, East wall, a Captain (Army) Harry G. Cramer was killed 21 October 1957 during a training action. He is listed on line 78, panel 1, East wall, which was added approximately a year after the Memorial was dedicated. For more information on the Wall, click here.